As we peruse this report on Operation Bluestar by Hartosh Singh Bal we find even more reasons why religion should stay out of South Asian politics (but then as a liberal atheist we are expected to believe that). At the minimum what is required right now are decent politicians who will not exploit heavenly matters for earthly gain. first, and perhaps the most disastrous, of Rajiv’s blunders. Our opinion (as informed by our relatives who survived in the war zone) is that 1984 was a great crime and happened as part of an action-reaction story (Hartosh does not account for the Hindus who were forced out of buses and summarily shot to death). But as he makes it clear like never before, the desperation of the Royal Family to get back into power in Punjab and how Rajiv Gandhi and his cronies played with fire (which later consumed the family as well). It is clear also that ordinary people matter very little in the scheme of things, with dynasties looking to survive (through a policy of divide and rule) or outstanding egos looking to be fed (by human blood). Justice in its own fashion has been handed out after more than 30 years have gone by. It is too little, too late. There is one thing also that Hartosh does not tell us about (he is correct in his opinion that the election of the BJP and the destruction of the Congress party is not a good omen for India). If it comes to a full fledged battle, the Sikhs will lose out badly and not just in India. The holy shrines of the Sikhs are spread out all over India and Pakistan. At present there are protests that the shrines are being desecrated in Pakistan. There was a major security incident whereby Sikh protestors converged on the Pakistan Parliament. Matters have become so polarized in South Asia that it may come to this that minority communities will not be able to survive outside of ghettos (and even imperfectly inside them). Case in point is Rabwah in Pakistan (Ahmadis) and Juhapura in Gujarat (Muslims). It will require statesmen of extra-ordinary stature to overcome the politics of polarization (the Aam Admi Party won in Punjab by associating with a Sikh militant group, see below). Politics for short term convenience and reliance on ideological extremists to get rid of moderates is the bane of South Asia. It must stop right now. We must have peace just to survive (Hartosh talks about the drug menace in Punjab threatening to derail another generation of youngsters after a previous generation has been lost to militancy), if not to prosper. 1990s, the number of pilgrims to the Darbar Sahib has increased rapidly. India has seen as much violence within its premises. 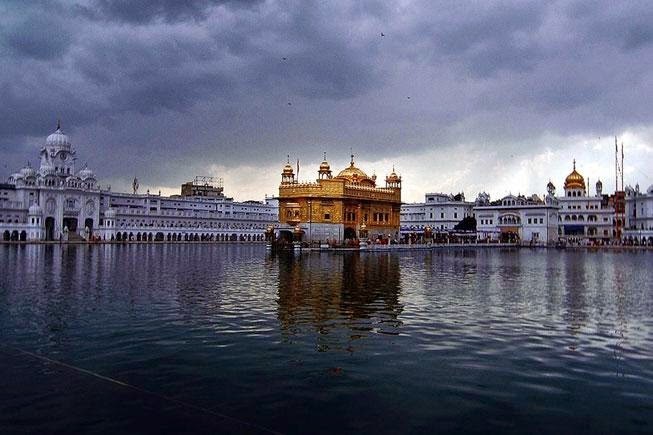 The sarovar was constructed in 1581 by Ram Das, the fourth Sikh guru. relationship with the durbar in Delhi. claimed to be revenue officers coming to deposit a large sum of money. head in one hand, still holding a sword aloft in the other. other until the very end. the hurry to carry it out, have never been properly explained. perhaps the most disastrous, of Rajiv’s blunders. Takht, where he had set up his final defiance of Delhi, stood shattered. before Bluestar; it took a decade for a semblance of peace to return. sense of quiet calm remains, though it is at odds with the shrine’s history. much violence within its premises. arrested in 1606, and tortured to death when he refused to convert to Islam. the paradigm for Sikhism’s relationship with the durbar in Delhi. disciples (piri), but also a preceptor in their temporal lives (miri). Harmandir Sahib and the Akal Takht. deposit a large sum of money. hand, still holding a sword aloft in the other. defender, the other a desecrator. ferocity of the Akali Dal, which represented Sikh interests in the state. schemed against each other until the very end. their aid; any support for his brand of Sikh orthodoxy was welcome. reduced to seeking his protection. to the nature of the final operation. little sense of the Congress’s contribution to the tragedy. history books, but their memory remains alive in Punjab. Next PostNext Sanity strikes in Sudan!!! !